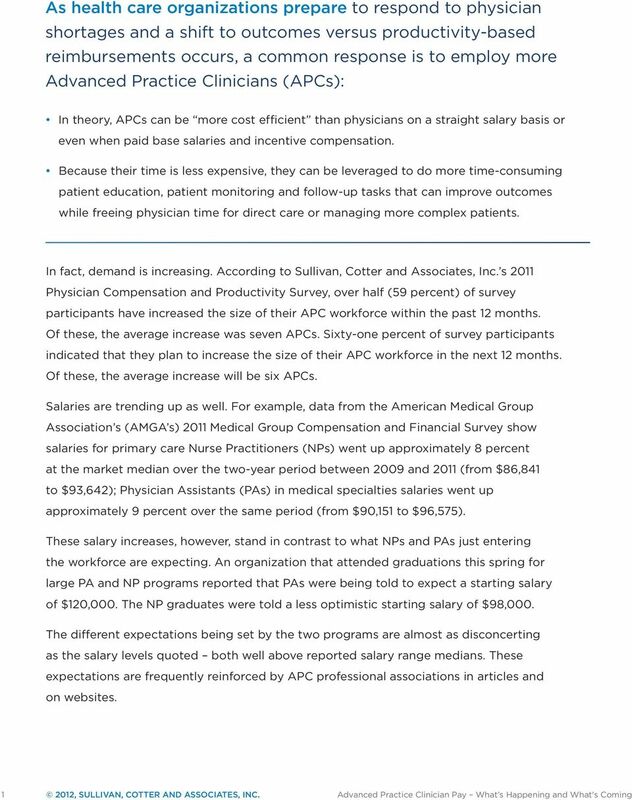 Download "ADVANCED PRACTICE CLINICIAN PAY WHAT'S HAPPENING AND WHAT'S COMING"
1 ADVANCED PRACTICE CLINICIAN PAY WHAT'S HAPPENING AND WHAT'S COMING 2012, SULLIVAN, COTTER AND ASSOCIATES, INC.
5 SullivanCotter to find, in helping a Client catalogue all their special pay practices for APCs, situations where pay for these extras has driven take home pay up more than 25 percent above the base salary. WHAT S NEXT AND HOW TO PREPARE? The growth in demand for APCs will fuel competition and thus salary increases. 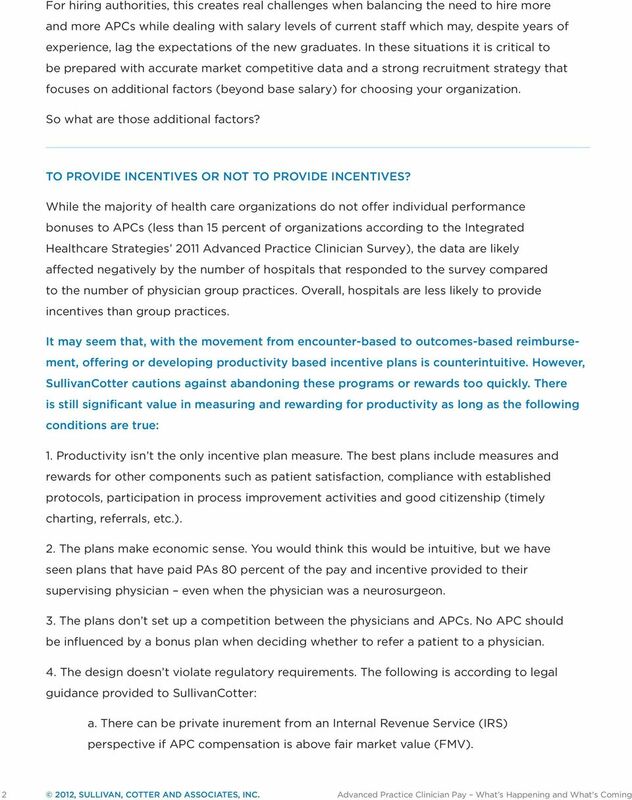 The need to balance salary costs against reimbursement will (for forward thinking organizations) provide opportunities to reward the best performing APCs and health care teams. The best strategy is to have a strategy. 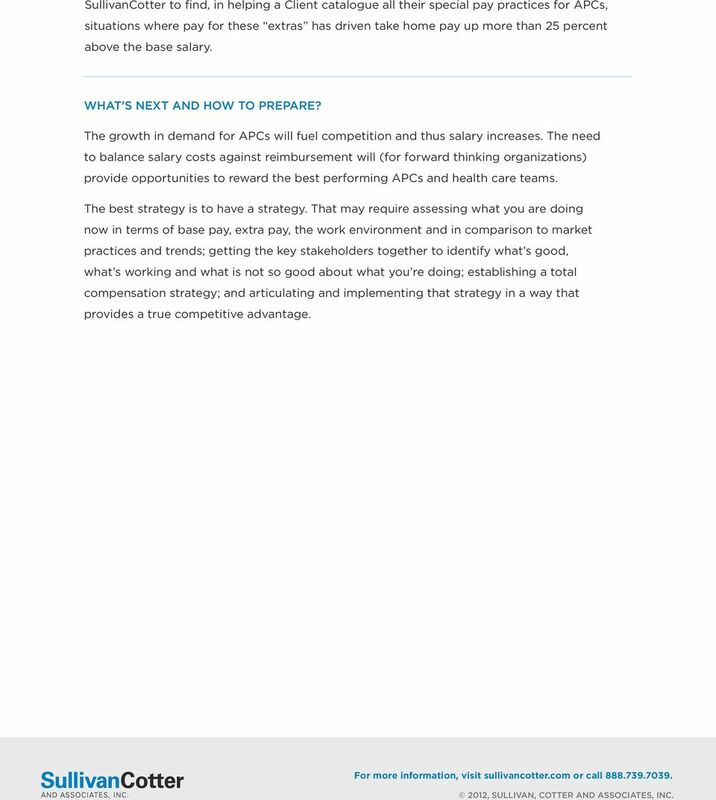 That may require assessing what you are doing now in terms of base pay, extra pay, the work environment and in comparison to market practices and trends; getting the key stakeholders together to identify what s good, what s working and what is not so good about what you re doing; establishing a total compensation strategy; and articulating and implementing that strategy in a way that provides a true competitive advantage. 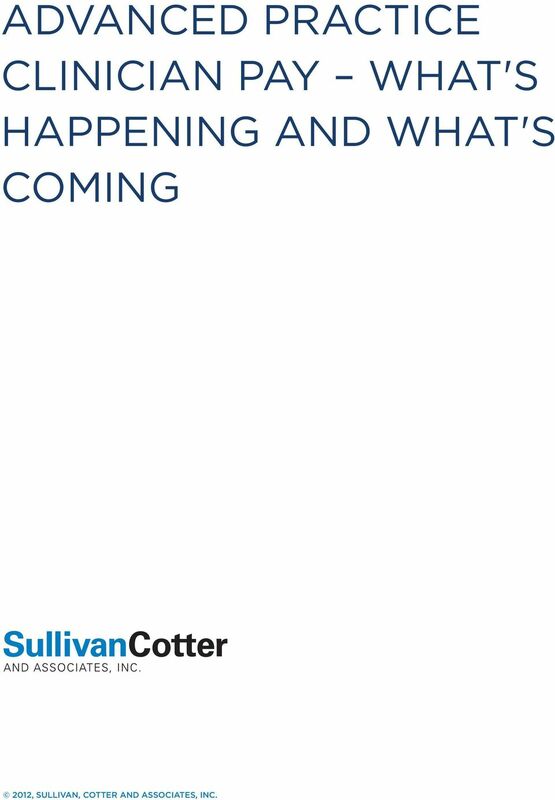 For more information, visit sullivancotter.com or call , SULLIVAN, COTTER AND ASSOCIATES, INC.
Access to Care: Primary Care Physicians Per 1,000 Pop. University of Michigan Health System Program and Operations Analysis. Utilization of Nurse Practitioners in Neurosurgery. Marshall Medical Center 1206(d) Clinics Case Study Marshall Medical Center 105 Bed Community Hospital, located between Sacramento and South Lake Tahoe 12 Outpatient 1206(d) clinics, including a R.H.C. 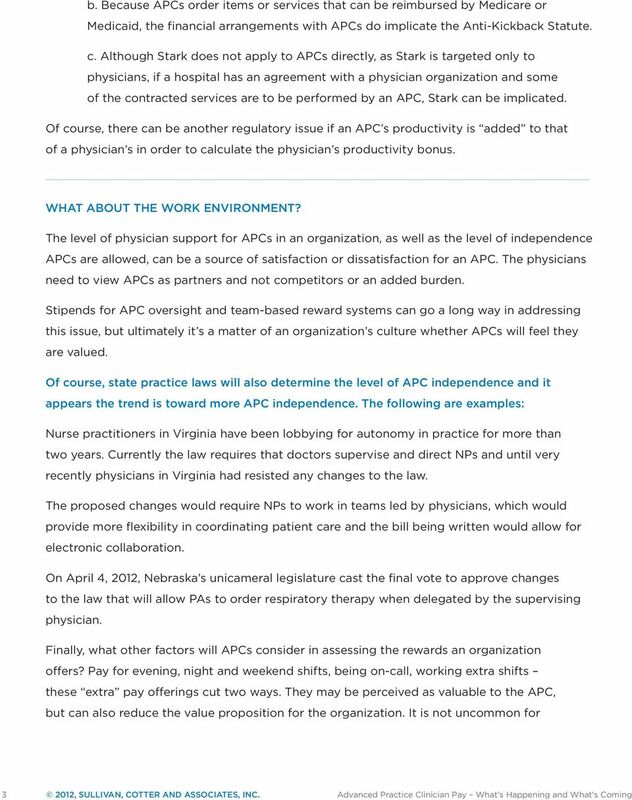 Compensation Techniques Used to Improve Provider Performance and Organizational Alignment. Tuesday, March 24, 2015 9:00 a.m. 3:00 p.m.